True. Not just anyone can drive to the Commons for dinner. Was recently asked how Gerun is immediately eligible at UP. Answer? 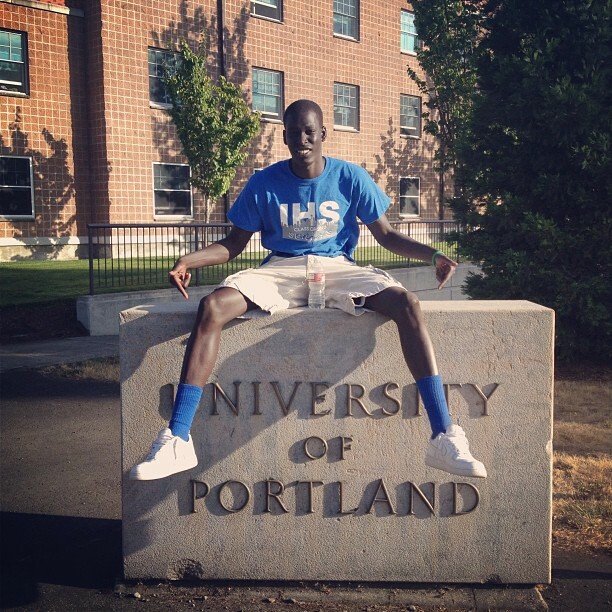 In response to UP Men's Basketball post on Facebook about Training Camp for the Spain trip, Gat Bol writes: "Will you guys have open gym for walk-ons?" Gatlauk Bol. Class of 2013, Ingraham H.S. in Seattle. Well, based on his comments, e.g. be sore or be sorry, he should be a Rev favorite. Good find. This would in fact be a great get...! Mr. Bol possesses a pretty nice soft touch….from what we see in a highlight reels, but he's definitely lacking in size/speed at this point in his development. 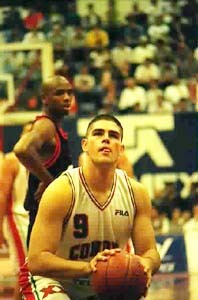 Where does "WCC impact player" fit on the A-F scale? At the very least, it helps the entire team to have another hungry, motivated teammate to push them at practice. And 14 is a nice round number. 7-on-7 scrimmages gives the coaches a chance to experiment with different line-ups and substitutions. From Mr. Bol: "Loving this place!" 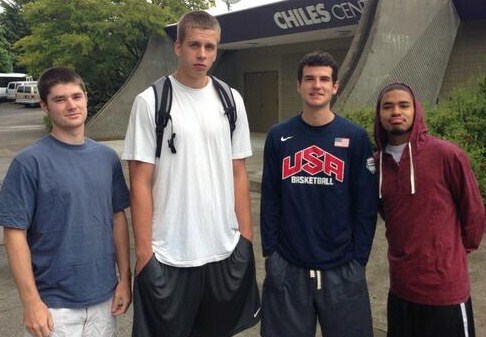 Does the team have an open try-out for walk-ons at some point? What's the process for Bol, or other potential walk-ons, to get involved with the team and the condition/strength coaches? Or even at an informal level of work-outs, scrimmages, etc? I don't know the answer to your question NPN, but I'm confident that Gat and Rev, or one of his assistants, has had a chat. In the past we've rarely known of walk-ons until the roster was "officially" announced....the whole process and announcement of David Ahern last year was the exception. 1) John Bailey went from being a R-So. to a Sr. (no surprise). 2) There are no walk-ons listed (yet). 3) There is no acknowledgement that Voldy went to WVU or that Bobby attended Santa Rosa JC (strange). They just have "previous school" set to "high school" - some switch will be flipped at some point, I'm sure. No shenanigans in play here. DeanMurdoch wrote: They just have "previous school" set to "high school" - some switch will be flipped at some point, I'm sure. No shenanigans in play here. I don't think I've seen the word shenanigans on this board before.....sounds more Irish than Canadian. Now all that has to be done is have the player profiles updated from 2011-2012 to 2012-2013. Things can get dangerous when you have a Gat. ESPN.com wrote: Duke coach Mike Krzyzewski has a simple way to stop the confusion regarding transfer waivers in college basketball: stop allowing them. "There should be no exceptions," Krzyzewski told ESPN.com. "Everybody should have to sit out, that includes a fifth-year player, just to make it equal. I think it's a farce, really." The NCAA has come under scrutiny after a number of recent transfer decisions, and the reason, Krzyzewski believes, is a lack of consistency. Although he'd prefer to see the entire process eliminated, he said, at worst, the NCAA should take an all-or-nothing approach. "Giving certain kids the right to play and others not the right to play, it should be done the same," he said. "If they want to let everybody play right away, then let everybody play right away. Everybody should be treated the same. I don't understand why there are exceptions to this rule." How about a rule where a coach who's program commits a major violation gets a ban from coaching for a year? That's also ridiculous - no exceptions. And considering Mike's support of Joe Paterno, i'm wondering if his meter for what is or isn't ridiculous needs calibrating. Although it's been a number of years since I lived in ACC and SEC country, and things may have tightened-up a bit since then, during my time in North and South Carolina and Florida, fans and coaches alike never seemed to care about the rules.....and were often open about flouting them. The coach K scandal was only a year or two ago. his defense of Paterno is about as old. and the Plantation concept comes not from some fringe nut, but from Walter Byers, the Czar of the NCAA from 1951 to 1988 who created the empire including the concept of the "student Athlete" which was an artifice to avoid paying workmans comp claims from players paralized playing football. He also jump started the supremacy of the NCAA Basketball tournament when he took it from 8 to 16 teams in the early '50's. ( folks our age will recall the NIT was the big tournament when we were young) It is now the main income earner for the NCAA. 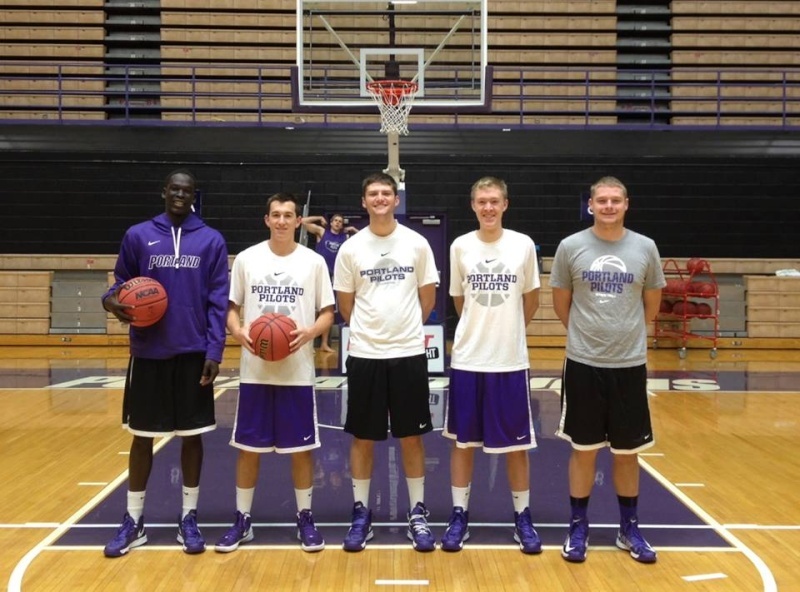 NoPoNeighbor wrote: Does the team have an open try-out for walk-ons at some point? What's the process for Bol, or other potential walk-ons, to get involved with the team and the condition/strength coaches? Or even at an informal level of work-outs, scrimmages, etc? There is no formal open try-out, but there's always the opportunity for a kid to workout with the coaching staff to have his potential evaluated. Mr. Bol was in the gym recently.....and he's certainly a great young man and has some basketball skill.....but he's not a D-1 player; just too lightweight and lacking in strength and quickness. Sometimes a young man like Mr. Bol can latch on as a student manager and, in addition to his normal duties, can be a "practice" player with the team.....gaining experience and utilize the training room facilities on a time-permitting basis. Gerun did not produce a ton at the high Division I level, but his skill set is undeniable. He moves well without the ball and can finish through contact, which every big man is expected to do. Although Gerun will likely come off of the bench this season behind All-Conference Honorable Mention forward Nicholas, he will contribute a ton and could end up averaging over 20 minutes per game for Eric Reveno’s squad. Not sure why the article used a picture of Coach Reveno instead of Voldy....maybe it's thought that's what Voldy will look like in 20 years.. Does the T-Room still provide free beer on a patrons 21st birthday? 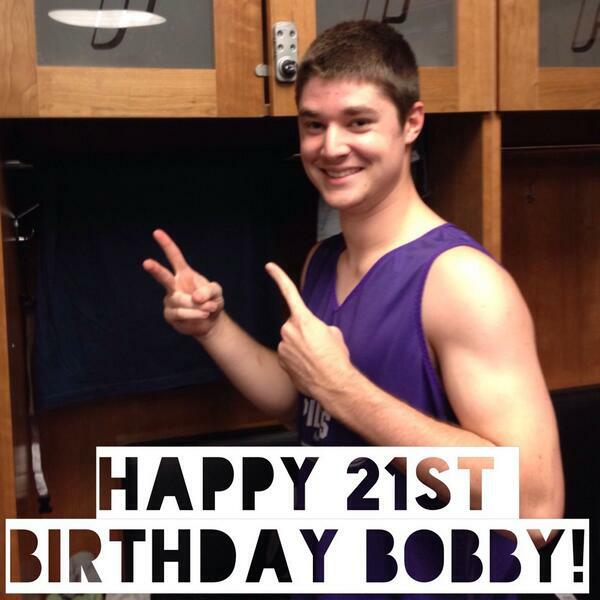 This article, and others have called Bobby a PG.....but I don't expect he'll play PG at UP. Alec is the starter, and assuming he gets back to full speed, DC will be his backup. The third PG, as I see it, is Bryce. Xubi may one day play PG, but not this year unless there are injuries, IMO. Bryce, DC, and Bobby will certainly rotate through a SG position with Tanner and Korey....and at some point Xubi, but I just don't see Bobby playing the traditional PG role. Big shout out & thanks to our 5 managers who do so much for our program behind the scenes and on the court!